Home › Blog › Bubbledogs – Hot Dogs & Champagne! At Bowes-Lyon Partnership, we’re always on the look out for new and exciting venues to recommend to members of our exclusive dating agency, and thanks to our favourite London Concierge, Bon Vivant, we’ve stumbled upon a fabulous one! Bubbledogs will open in July on Charlotte Street in Fitzrovia, with James Knappett (previously of The Ledbury, Noma and Marcus Wareing at the Berkeley, among others) as head chef and Sandia Chang (who has worked at The Berkeley, Noma and Per Se) as General Manager. Bubbledogs will serve hot dogs and grower Champagne. Yes,that’s right! 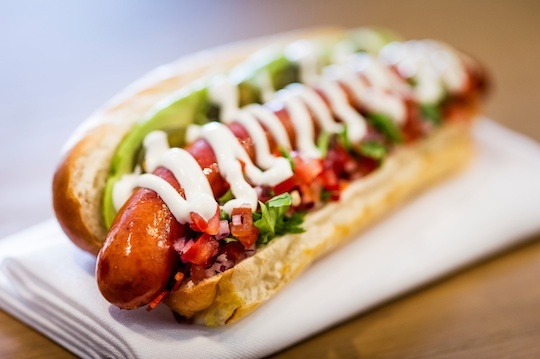 There will be a menu of ten hot dogs served on traditional steamed buns, including the BLT dog, wrapped in bacon and served with truffle mayo and caramelized lettuce; the Jose dog with guacamole, sour cream, salsa and jalapenos, and a regularly changing guest chef’s special. So if you’re looking for somewhere relaxed with a sophisticated twist to go on a date, Bubbledogs could be just the ticket! Thank you Bon Vivant for another great venue recommdation!